Noted Nepali litterateur KN Sharma has been conferred with the first Rashmi Prasad Allay Puraskar on Friday for his contribution towards the development of Nepali language. 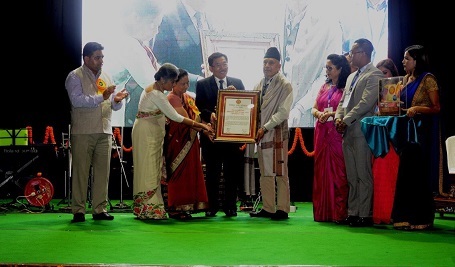 Sikkim Chief Minister Pawan Chamling presented the award to Sharma during the 26th Nepali Bhasa Manyata Diwas celebration organised by Sikkim Pragya Pratishtan here at Manan Kendra. The award comprised a shawl, memento, certificate and cash prize. The programme was scheduled to be held on August 20 on Bhasa Manyata Diwas but following the sad demise of the former Prime Minister Atal Bihari Vajpayee on August 16 the programme was postponed for today. In his address, the CM, who was present as the chief guest, announced to provide five lakh rupees from the CM fund to Sikkim Pragya Pratishtan. He also expressed his happiness on the initiative of SPP for constituting the award in the name of late Rashmi Prasad Allay. He also paid tribute to the contributions made by late Allay towards the development and promotion of Nepali language in Sikkim. The chief minister also appreciated the initiative of SPP for the preservation, development and promotion of Nepali language. CM also announced to provide additional two lakh rupees to SPP to start publishing children magazine for students. He mentioned that after lots of struggles Nepali language got recognition 26 years back. While speaking on the struggles of the people for the recognition of Nepali language, he also mentioned about the contributions of former CM late Nar Bahadur Bhandari and his wife former MP, Dil Kumari Bhandari. CM stated that Nepali language got the recognition after lots of struggle but now after getting the recognition Nepali language has been losing its importance.